Imogen's Typewriter. 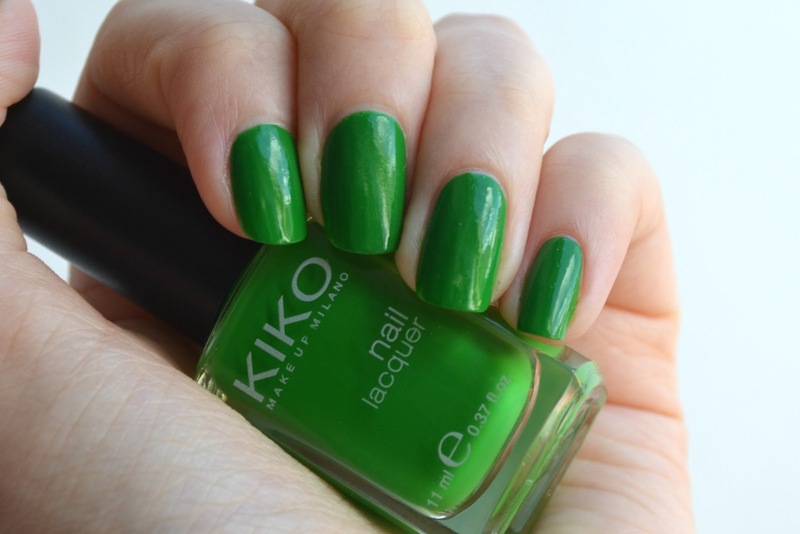 : Beauty Review: KIKO Nail Lacquer in Grass Green! Three guesses what Imogen's favourite colour is? Way back when I was in Florence I happened by a Kiko Cosmetics store nearby the pizzeria I frequented during my stay and picked up some nail polish while I was there as they are all super cheap and a couple were even on sale. I got 7 of them and I think I paid around £10. I'm finally getting around to wearing them and blogging about them so look out for a fair amount of green nails on the blog over the next few weeks! This one was actually a bit of a pain compared to the others! It took absolutely ages to dry and took three coats to get a nice even finish. It really needed a topcoat to add shine and even it out but I have an OPI dupe and it's the same story with that one too. I think it's just a problem with bright greens but I do love how it looks. So cheerful and perfect for Christmas tree nail art! Kiko polishes all have really lovely wide brushes similar to OPI too- no cheap brushes here.